The framed photograph flew across the room to land in the huge tiled fireplace. The glass shattered into countless sharp shards, and the edges of the photo began to curl, withering in the heat of the flames. Unblinking, the man stared down into the contained inferno, watching as the delicate features of the young, blonde woman turned to ashes. Against the menacing black of the gathering storm clouds, the small red and yellow plane appeared little more than a brightly colored fishing cork, bobbing up and down on the currents of air. Jim Ellison stared down into the churning waters beneath the plane and fought against the queasiness rising in his gut. He leaned his head against the seat back and focused on taking deep, calming breaths, the way Sandburg had shown him. Land had disappeared almost thirty minutes before, and ever since, Jim had been intent on keeping his discomfort under control. I can handle this, he assured himself. I know why I have this phobia now, and I don't have to surrender to it any more. What his mind accepted, somehow, the rest of his body seemed determined to ignore. Jim looked down at the dark waters. At the sight of the waves, unbroken by any sign of terra firma, Jim's breathing quickened as a cold chill crept through his body. Reaching over, Blair laid a warm palm across the sentinel's forehead. "Well, you don't feel okay to me. You're chilled, man. Clammy, almost." Setting his book on the seat beside him, Blair turned to face his friend. "Close your eyes," he ordered gently. Ellison obeyed even as he protested. "This won't work, Chief. I've already tried the deep breathing. I know we're all right. The plane isn't going to crash into that water, but still..." His words trailed away as images of the black, churning water took over his imagination. Blair's voice was soft and low. "I know. It's not easy, Jim. Overcoming a phobia is a long process, and it really hasn't been that long since you got a handle on exactly why you're afraid of open water. Each time you confront the fear, it’s a step forward. I mean, look how great you did out on the Cyclops rig. This is just one more step toward living with what happened to you as a kid and dealing with the effect it had on your psyche." Jim didn’t reply as the calming voice murmured on. "Take deep breaths ... in ... out ... slow and easy." Long minutes later, Jim began to relax. Finally, without changing intonation, Blair added, "Tell me about your cousin Rucker." Jim released his breath, concentrating on the feeling of relaxation as it spread through his body. "Ruck's a couple of years older than I am. Actually, we’re second cousins. Our dad's are first cousins, but they never had much in common. Ruck’s dad was a great guy. They had the kind of home where the door was always open, and there was always a gang of kids hanging around. I stayed over there as much as I could. His dad died when Ruck and I were in our twenties." Jim took another deep breath and let it ease out slowly. "I really miss him, Chief. In many ways, he was more of a dad to me than my own father ever knew how to be." "I'm sorry, man," Blair said quietly. "What about Rucker? How'd he end up in the Coast Guard?" Jim chuckled, his eyes still closed. "Rucker and I followed similar paths, I guess. College, then the military. He was in the Navy where I chose the Army, but we both liked the military life. He stayed until last year when he joined the Guard." Jim considered the paths he and his cousin had chosen. "I don't know why we haven't seen each other more. Ruck and I were like brothers when we were younger, a lot closer than Steven and I have ever been." “Maybe. With Ruck, it’s hard to tell. He plays his cards pretty close to the vest.” Jim let the conversation die, turning his concentration again to his breathing exercises. He wasn’t sure how much time had passed when he felt Blair’s gentle squeeze on his biceps. "Hey, Jim," Blair said quietly. "I think we're here." Jim opened his eyes and peered warily out the window. The plane was approaching a small island, the majority of which was covered with evergreens. Churning waves crashed against its rocky shore, their frothy foam splattering wildly on the dark boulders. To the west, a lighthouse stood in stark contrast to the gray rocks and green trees. Its cheery red cap crowned a tower painted white. The plane gradually lost altitude, dropping closer and closer to the water. A surge of the old panic tightened Jim's chest, and he leaned his head back again, shutting his eyes against the vision of the approaching water. Beside him, Blair counseled quietly, "Just keep your eyes shut, Jim. We're almost down. Breathe...nice and slow...that's the way." The landing was fairly rough. Tossing on the waves, the plane maneuvered up to the shore and the dock that projected into the water. The pilot, Eddie, hopped onto the pier, securing both ends of the plane with lines attached to metal rings. Gratefully, Jim crawled out next, his duffel clenched tightly in his hand. Dropping the bag to the pier, he immediately turned away from the sight of all that water. "Oh, man," he muttered, scrubbing his hand across his face as he took a deep breath of fresh air. "You okay there, Jim?" Eddie came up behind him. "I brought her down as smoothly as I could, given those waves." Jim nodded quickly. "Yeah, I know. It wasn't your landing, Eddie. Just...those miles of open water." Blair came up and stood at his side, and he looked over at his friend, smiling weakly. "I got this...slight phobia." "I suppose that's why you chose the Army over the Navy, right?" Blair teased gently. A moment later, as Eddie checked the mooring on the plane, he whispered, "You okay, man?" The sentinel nodded and forced a smile, grateful for the concern in the blue eyes. "I'm fine, Chief." Jim turned a shade paler even as he chided himself inwardly for his reaction to the mention of fish. "Could we back off the seafood chitchat?" he suggested. Smiling at his partner, Blair said, "Come on, Jim, buck up. You know, 'the time a man spends fishing is not deducted from his life.' "
Eddie's face lit up with a broad grin. "Isaac Walton, The Compleat Angler. He wrote that back in, uh..."
Blair jumped in to supply the missing information. "1633. That's great, man. So, theoretically, if you fish every day, you're going to live forever." "Sounds good to me," Eddie agreed enthusiastically. "Yeah," Jim muttered, "well, Sir Isaac must have run out of bait, 'cause last time I checked, he was still dead." Jogging down the steps from the hillside above was a man outfitted in yellow coat with a blue Coast Guard cap. Not quite as tall as Jim, Rucker Ellison wore a broad smile as he waved at the new arrivals. “Who’s Andy?” Blair inquired, glancing from Rucker to Jim. Eddie shook his head. “You’ll have to carry on without me. I’ve got to head up to the res at Taholah and drop off some medicine. I’ll swing back down and pick you guys up tomorrow afternoon as long as that storm blows over. No way we’re going to make it across this channel in a 40-knot gale.” Looking at Rucker, Eddie added, “Hey, buddy…Happy birthday, man.” He tossed Rucker a small package. “Take care, Eddie,” Rucker cautioned. He looked out over the water at the heavy, black storm clouds that continued to roll in. The wind had picked up considerably during their time on the pier. “South-southeast,” he muttered under his breath. “Think it’s gonna be a big one?” Blair asked. “Ooh…” Blair replied with a nervous glance at the threatening clouds, blowing in quickly now on the breath of the strong winds. Laughing, the three men turned toward the Coast Guard station perched above them on the hill. Following Rucker, Jim and Blair began the climb up the wooden steps. By mid-afternoon, the storm’s intentions were clear. Storm Island was going to live up to its name. On the small Coast Guard station and dwelling, the shutters banged wildly in the wind. Tree branches whipped furiously as the waves pounded the gray rocks below with increasing intensity. Blair looked out the last open window at the launch bobbing on its mooring. “I hope it’s okay. I sure wouldn’t want to be marooned out here if that launch goes under.” He stepped aside as Rucker came to close the window. “Oh, yeah, I know the type,” Jim agreed, bending down to pull a wrapped package from his duffel. “Well, here’s something for your troubles, Ruck. For the man who has everything. It‘s from me and Sandburg.” Sitting down on the couch, Jim opened a back-issue of National Geographic and began flipping through it. An ironic smile touched his face at the first article he saw - ’The Threatened Rainforests of Borneo.’ He’d have to hide that one from Sandburg. Might give the kid second thoughts about what he’d passed up. “Which reminds me,” Jim interrupted, “if we’re cooped up here all weekend without being able to fish, where is your television? There’s a World War II movie marathon starting late this afternoon that sounded good. We could pop some corn, and…” His words trailed off at the look on his cousin’s face. “We don’t have one,” Rucker stated flatly, shaking his head. Jim felt the same cut-off from civilization feeling he’d had at St. Sebastian’s Monastery. No cell phone. No TV. No fishing. It wasn’t that he hadn’t managed to survive without the comforts of a modern lifestyle before. The jungles of Peru weren’t exactly a technological Mecca. 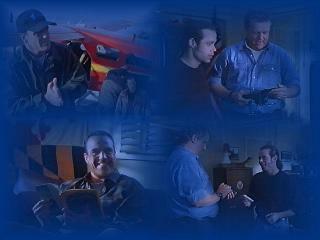 But now, he didn’t have to go without watching the Jags or his favorite movies, and Jim preferred to keep it that way. He tried to look at the bright side for Rucker’s sake. At least they were going home on Sunday. His cousin lived this life 24/7. Blair moved over to the computer. “That’s okay, Jim. I’ve been meaning to show you this cool site on Peru I found last week. You’ve got an Internet link on this computer here, don’t you?” He looked at Jim’s cousin hopefully. Jim caught the startled look in Sandburg’s eyes and grinned. “You’re on. I’ll get the deck,” Rucker agreed, disappearing for a moment into the small room off the main living area. Jim dropped the National Geographic on the table, cover down, and he and Blair joined Rucker in front of the radar. “Go to more detail,” Jim suggested as he studied the quickly moving blip on the scope. “Definitely a muscle machine. Maybe a cigarette boat.” Straightening up, Rucker went to the storage closet and pulled out his rain gear. “Could be pilot error or a damaged craft,” Jim suggested. The sound of rolling thunder in the distance confirmed Rucker’s assessment. They didn’t have time to waste. The rain was coming down in sheets, blowing nearly horizontally against the choppy water. Blair pulled his raincoat tighter around his throat, hoping to shield himself from becoming totally drenched. Why was it so many of his adventures since teaming up with Jim involved being wet, cold, and miserable? “I really hate being cold,” he muttered to no one in particular. He stared at the choppy waters ahead from his vantage point between Rucker, who was piloting the launch, and Jim, standing in the passenger‘s area. Turning halfway around, Jim shot him a quick look of sympathy before returning his attention to the water ahead. “I think she’s headed for the other side of Long Point,” he shouted above the roar of the boat’s engine. Blair increased the pressure on Jim’s back, biting back a hasty reply. He needn’t have worried; Jim covered smoothly. “Nice job, Jim,” Blair muttered under his breath, knowing the sentinel would hear. Suddenly, the boat ahead of them swerved sharply to the right. Directly ahead lay the rocky shore of Long Point. Jim flashed a quick smile. “When am I not careful, Chief?” Turning, he headed toward the front of the boat. “You want the complete list?“ Blair muttered, knowing full well his friend heard him clearly. 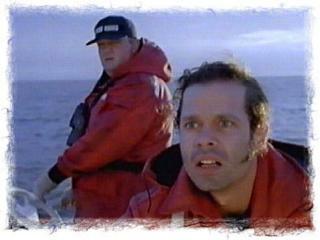 Blair watched anxiously as Jim leaned over the side of the boat. “Pull over to her, Ruck! Come up a little closer!” He tried reaching out, but the distance was too great. Fighting to keep his balance, Blair watched as their boat pulled dangerously close to the runaway vessel. Suddenly, the sentinel leapt from the safety of Ruck’s launch toward the other boat. For an instant, he seemed suspended in mid-air, then Jim hurtled down, missing the speeding boat by inches. “Jim!” Blair grabbed Rucker’s arm, but Jim’s cousin ignored him completely as he veered away from the unpredictable boat. Jim was hanging over the side, his arms wrapped over the Sea Ray, his legs bouncing violently off the rock-hard water. Blair didn’t want to think what that pounding felt like to the sentinel. He held his breath and watched. With a final burst of strength, Jim heaved himself up and over the side of the boat, disappearing on the other side. The warmth of the small Coast Guard station was a welcome change from the storm. With Rucker standing beside him, Jim studied the young woman wrapped in blankets and huddled on the couch. Blair brought over a cup of steaming coffee and handed it to her. “How are you feeling?” Sandburg asked, his blue eyes warm with concern. “What’s your name?” Blair’s smile seemed to put the woman at ease, Jim noticed, and she answered readily. Jim felt a warning tickle at the back of his neck. “And what’s his name?” There was definitely something about this whole situation that he didn’t like. There was a long pause before Monique looked up at Jim. “Enrique…Enrique Mendez. He’s…an investment banker.” Her eyes dropped again to her coffee. “Because today he started drinking, and he said he was going to get a gun. Then he passed out. So, I slipped out a window and ran down the docks to his boat.” She glanced up at Blair with large, sad eyes, and Sandburg smiled encouragingly. “Where were you going to go?” Jim kept his voice neutral. The young woman would clam up in a heartbeat if she didn’t trust them. Jim concentrated on Monique’s physical reactions during her story. Her heart rate was definitely too fast, and her breathing too rapid. Of course, that wasn’t necessarily a sign she was lying. If she had been as frightened as she claimed, both could be normal reactions to her experiences with Enrique and on the boat during the storm. Blair jumped in with a comforting smile. “I can teach you some meditation tips. Helped my mom out big time.” Monique smiled up at him and nodded her acceptance. Something hot and dangerous flared in Jim at Sandburg’s offer. Watch yourself, Chief. I don’t have a good feeling about this one. Before Jim could comment, however, the lights quickly flickered twice, then blinked out completely, leaving the small room in gray darkness. Power they could live without. “What about communications?” Jim asked quickly. Rucker nodded. “Radio link’s protected with a separate system coming down from the tower.” Reaching for the wooden coat rack, he began pulling on a heavy coat. “With a little sweat, we could probably jury-rig something for our power down here, but not until this weather breaks. We’re just going to have to ride her out a while. I’m going to go double up on the moorings on those boats. You better finish dogging this place down, Jimmy.” Rucker opened the door, letting in a blast of cold, wet air, then he was gone. “I’m so cold,” Monique complained from her nest of blankets. Rucker was finally satisfied with the safety of the Coast Guard launch. By the time he’d finished looking the boat over, the rain was pouring down in sheets whipped by the powerful wind. He had seen waves higher during his service on Storm Island, but at that moment, he couldn’t remember exactly when. Rucker moved toward the Sea Ray. Nice craft, he thought appreciatively, as he moved down to the small galley, checking cabinet doors and drawers to be sure all was secure. It was amazing what a mess could result during the pitching and rolling of a big storm. The girl seemed nice enough. He’d hate for her to have a gigantic cleaning job on her hands on top of everything else. Rucker spotted an open cabinet door. A briefcase lay inside. He half turned away, then faced the briefcase again, frowning. Something was not quite right. Monique had told them she had no luggage, that in her terror, she had not taken time to gather any of her belongings before fleeing. So, what was an expensive leather briefcase doing here? Giving in to his curiosity, Rucker carried the case to the table and popped open the lid. He bit back a gasp as he stared wide-eyed at the contents. Quickly closing the case and heading for the dock, Rucker sent up a quick prayer of thanks that Jim had picked this weekend to pay a visit. A barefoot Monique emerged from the curtained sleeping area in dry jeans and plaid flannel shirt, unbuttoned over a white, thin strap t-shirt, rubbing her long hair with a towel. Blair’s clothes hung slightly large on her small frame, but they fit well enough for hand-me-downs. Blair smiled approvingly. “Oh, hey, all right. Grunge looks pretty good on you.” He looked over at Jim and started to comment to him about the improvement in Monique’s appearance, but he stopped short when he saw his friend’s face. Jim was looking at Monique, all right, but the look on his face was far from approving. The sentinel’s blue eyes were cold steel as he regarded the young woman dressed in his guide’s clothing. When Jim didn’t acknowledge Blair’s comment, the oppressive silence in the room grew even heavier. Blair stared at his friend, trying to figure out where this sudden antagonism was coming from. It was almost a territorial reaction - the sentinel defending his turf. Every time he made a move of welcome or friendship toward Monique, Jim seemed to jump into this over-protective mode. What sort of threat could Monique be to him? Uneasily, Blair said, “It’s okay, man. Really. I’m sure she’ll take good care of them.” Monique nodded silently as she laced up the boots. “She’d better,” Jim muttered, moving to open the door for his cousin as the sound of running footsteps reached the front porch. Dripping wet, Rucker shed his rain gear, then went across the room to Jim. Setting the briefcase down on the table, he opened it for Jim’s inspection. Jim nodded. “Monique St. James, you are under arrest.” Reaching behind, he pulled out his cuffs and moved toward the couch. “What are you doing?” Blair protested. Rucker spoke up, holding out the open briefcase. “She came in with a little package.” In it were two wrapped packages. “Heroin,” Jim added coldly. “Mexican brown. Get up.” Blair’s heart sank. If there was a single, sure-fire way to get on Jim’s blacklist, it was to be caught with drugs.